As its name suggests, Triple Falls is a three-tiered waterfall, with the two drops being a bit shorter than the lower one, which is more of a cascade. It could almost be considered three separate falls, except they're so close together on the river they're usually considered one waterfall. The river creates a powerful, thunderous roar and generates plenty of cooling mist even with water flows down to below normal. A swirling pool with waves lapping at its edges sits between the middle and lower drops. 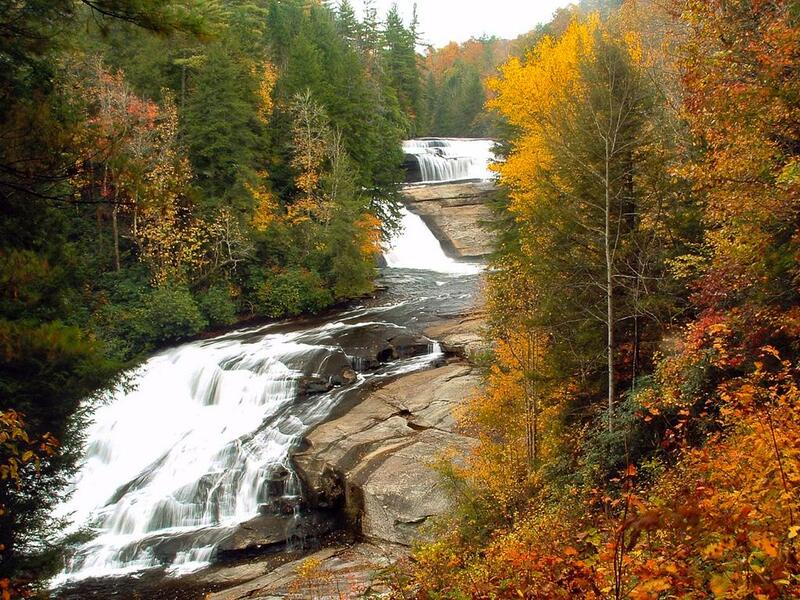 Triple Falls in fall color. Each drop has its own distinct character, and you can access the river in between the lower two drops using a set of stairs descending from the Triple Falls trail. Cross the pedestrian bridge and take the Triple Falls trail to the left, under the road bridge, and then up the river for 0.3 mi to the falls. 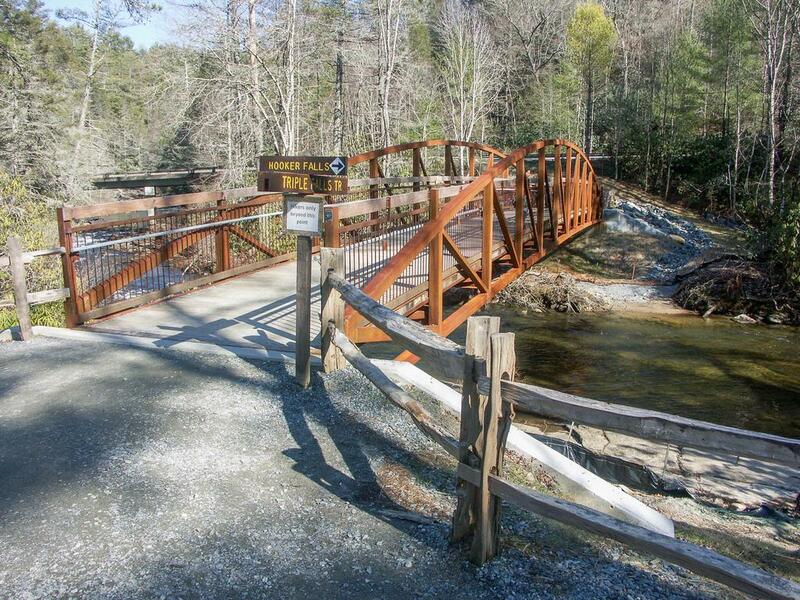 New pedestrian bridge over the Little River on the Triple Falls trail. The trail becomes steep near the falls overlook - which is the best view of the falls. Just past the overlook, there is a side path to the right which leads to a nice picnic shelter with a view of the falls. Just past that is an intersection with a side trail on the left, which leads down a set of steps to the middle of the falls. It comes out on a flat, wide ledge above the lowest tier of the falls, providing a fantastic close-up view. If you do this, be careful and stay only on the flat, dry areas of rock (there's probably an acre of it) as the DuPont State Forest rules specify. 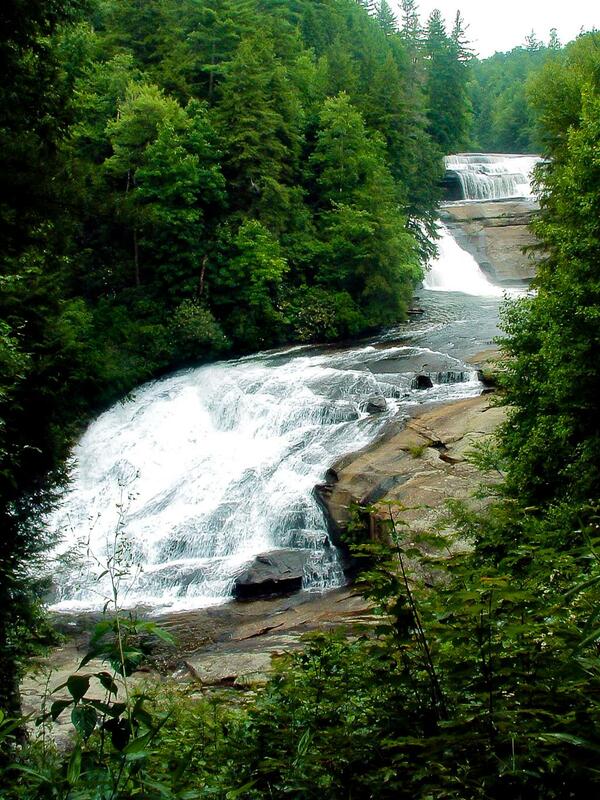 People have died going out-of-bounds at Triple Falls, which includes anywhere in the water or anywhere you have to climb up or down rocks to be. Just don't risk getting a ticket or injury here.